If you’re a campaigner looking for some books to add to your Christmas list here of some of the recommendations of the best books that I’ve enjoyed in the second half of 2018 – and as I start I want to acknowledge that as putting this list together I’ve read too many books written by men. 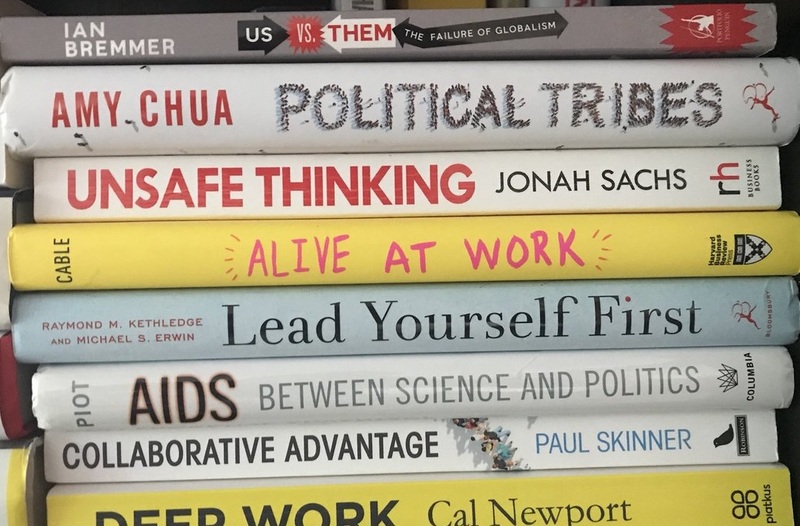 I’d also suggest that you have a look over at this list that I put together in the summer – if I was doing a top 10 books of the year I’d definitely be adding New Power and Twitter vs Tear Gas onto the list. How To Read A Protest – using two protests that happened over four decades apart, LA Kauffman looks at what the March on Washington in 196? and the Women’s March in 2017, can teach us about the role of demonstrations and protest in causing change. As campaigners we should be looking to learn from history – this short but inspiring read does just that. The Fixer – Bradley Tusk is the political strategists behind the campaigns start-ups like Uber have run. I’ve written before about some of the interesting approaches they take to converting app users into apptivists, and in this book which is part autobiography, part political playbook he unpacks the approach that many corporates take to winning change. You might not agree with the changes they’re pushing for but if you want to learn how they do it this book takes you inside. Death of the Gods – there is a blog post I need to write about the new sources of hidden power that are increasingly influencing the campaign landscape (think about the power of the group that set the Facebook moderation policy or the influence of thinktanks linked to 55 Tufton Street). Carl Miller does a great job at exploring the new actors in the global power grab. In many ways it doesn’t make for comfortable reading but it helps to think about where power might sit in years to come. It’s a great build on The People vs Tech. Don’t Trust, Don’t Fear, Don’t Beg – this is a true story that reads like a thriller, as Ben Stewart tells the inside story of the Greenpeace Arctic 30. It’s a page-turner about the campaign to secure the release of the campaigners, a sobering reminder of the sacrifice that the group of the activist was willing to take to highlight the risks of drilling for oil in the Arctic circle and the suppression of dissent in Russia. Re: Imagining Change – drawing on the lessons the experts at the Centre for Story-based Strategy have learned from 20 years of building campaigns that win change narrative, it’s a really practical read with lots of great advice about how to frame your campaign to win – and let’s be honest most campaigners don’t spend enough time thinking about the role of shifting or re-framing a narrative to win change. All Out War – sure, everyone is tired of talking and reading about Brexit, but Tim Shipman has the inside story of the 2016 referendum campaign, and it’s an account that I do think all campaigners should plan to read. There are lots of lessons in it for on message discipline matters, using narrative over numbers, trying new tactics and getting out of your bubble to understand your audience. Engines of Liberty – another book from across the pond, but David Cole is the legal director of the ACLU (an organisation that has been getting lots of kudos this year for its approach to defending the US constitution while Donald Trump is President), the book takes a deep dive of three successful movements in the US over the last 30 years, and looks at the role of citizen activism to influence change. There is a heavy focus on how campaigns can use legal means to win change, but also lots of smart advice about how to avoid campaigning pitfalls.